Navy SEAL “Pitbull” Percy Taylor is taking some much-needed R & R when he’s confronted by danger in the form of kidnappers and poachers. Pitbull is used to being on tough missions, but now he also needs to safeguard his beautiful pilot, Marly Simpson. 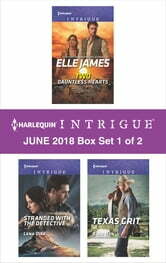 Look for Harlequin Intrigue’s June 2018 Box set 2 of 2, filled with even more edge-of-your seat romantic suspense!